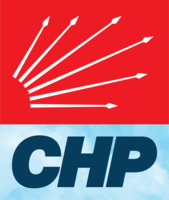 Tha Pàrtaidh Poblachdach nan Daoine (Turcais: Cumhuriyet Halk Partisi air neo CHP, IPA: d͡ʒum.huː.ɾi.ˈjet hɑɫk pɑɾ.ˈti.si) na phàrtaidh poileataigeach a tha a' gabhail ri deamocrasaidh sòisealta anns An Tuirc. Chaidh am pàrtaidh a stèidheachadh ann an 1919 le Mustafa Kemal Atatürk nuair a bha Impireachd nan Otomanach a' briseadh às a chèile aig deireadh Cogadh a' Cheusair. 'S e gu robh Pàrtaidh Poblachdach nan Daoine airson Poblachd neo-eaglaiseach - ris an canar Kemalizm (Gàidhlig: Kemalas) - a chur an àite an Rìoghachd chreideamh a bh' ann fad linntean roimhe. Ghabh an CHP ri deamocrasaidh sòisealta ann an 1965. 'S ann bho na bailtean mòra, sgìrean air a' chladaich, Alevis agus daoine meadhanach beairteach 's a tha am pàrtaidh a' sireadh bhòtaichean. ↑ Webster, Donald Everett (1973). The Turkey of Atatürk; Social Process in the Turkish Reformation. New York: AMS Press. ISBN 978-0-404-56333-2. Air a tharraing à "https://gd.wikipedia.org/w/index.php?title=Pàrtaidh_Poblachdach_nan_Daoine&oldid=533285"
Chaidh an duilleag seo a dheasachadh 20 dhen Iuchar 2017 aig 12:01 turas mu dheireadh.